Development expenditure, which in 2014-15 was much higher than the national average as a proportion of GDP, fell through the last four years in Mizoram even as the national average moved higher. The election-bound Northeastern state, however, has seen a fall in its expenditure on the social sector, development and education. Mizoram not only reined in its high fiscal deficit of 2014-15 — 9% of its gross state domestic product — but also clocked a surplus of 2.7% and 1.3% in 2015-16 and 2016-17, respectively. The election-bound Northeastern state, however, has seen a fall in its expenditure on the social sector, development and education. Its social sector expenditure fell from 25.1% of its GSDP in 2014-15 to 9.1% in 2017-18, compared with a national average of 6.7% and 7.9%. Development expenditure, which in 2014-15 was much higher than the national average as a proportion of GDP, fell through the last four years in Mizoram even as the national average moved higher. One parameter in which Mizoram continued to perform better than India was health spending. 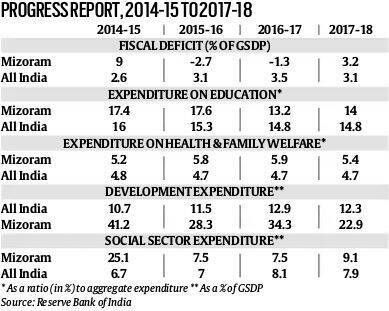 India’s expenditure (as a percentage of total expenditure) remained largely flat over the four years, while Mizoram’s rose slightly in 2015-16 and 2016-17, before falling in 2017-18.